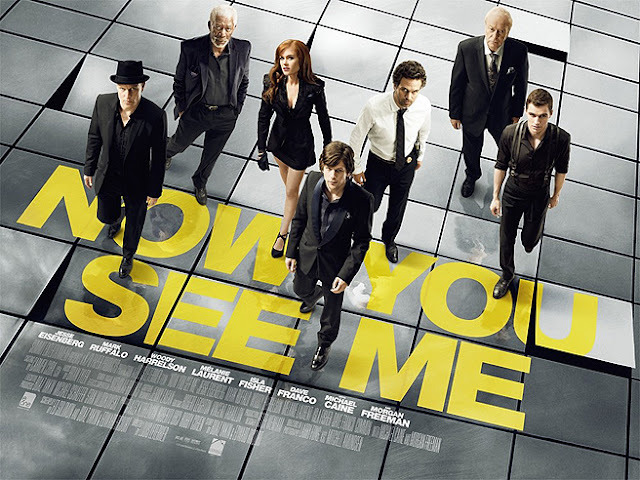 I finally got to see the movie NOW YOU SEE ME today. I think in a previous blog I mentioned it looked like it had potential from watching the trailer. Well, I'm happy to say that it more than delivers. The movie has quite a cast: Jesse Eisenberg, Woody Harrelson, Mark Ruffalo, Michale Caine, Morgan Freeman, Dave Franco, Melanie Laurent, and the drop dead beautiful Isla Fisher. I frankly could have watched the movie with ONLY Isla Fisher and I would have been happy, but that's just me. The story is basically about a group of magicians who are known as the Four Horsemen, who put on a show together and the big trick is robbing a bank in the middle of the show and giving all the money to the audience. That is the premise, but the story is much more involved and there are twists and turns and pieces of misdirection that are worthy of the best magic show. In fact, the opening scene is a magic effect not only in the movie but it also is subtly done to the theater audience, brilliant! My thoughts on the movie after it was over was that the must have scene David Copperfield's PORTAL Illusion and created this elaborate story around that trick. David is one of the consultant's on the movie, as well as Keith Barry and Jonathon Levit and Dan and Dave Buck. The magic in the movie is exceptionally well executed and frankly inspiring. One thing I found interesting is the connection to magic that many of the stars have. Jesse Eisenberg is from NJ and his earliest exposure to magic was from a very popular NJ kidshow magician named Bruce Bray. I knew Bruce, he was a great guy and sadly he passed away not long ago from complications due to an accident. Mark Ruffalo actually co-starred as Theo Hardeen in the TNT HOUDINI movie that came out a few years back with Jonathan Schech in the lead role. Michael Caine of course was in The Prestige and another movie called Is Anybody There in which he plays a retired magician. Then there is Dan Franco, who is the brother of James Franco, better known now as the Wizard from The Great & Powerful OZ. That's as close of a connection as I could put together for Dan Franco, but he does do a great job in the movie. I'm not really sure what the others stars connections to magic are, but I can say that Woody Harrelson and Isla Fisher both did pretty decent tricks on TV Talk Shows promoting the movie. Now I have to tell you about the strangest thing that happened when I saw this movie today. I walked into the theatre with a buddy of mine, a fellow entertainer. As we sat down we noticed the theatre was fairly packed, pretty unique for a weekday showing. But the odd thing was that the movie was packed with all women. We actually thought that we might have gone into the wrong theatre, so I got up and walked out to make sure we were indeed in the correct theatre. We were. So next we figured THEY were all in the wrong theatre and the moment the movie started there would be a grand exodus. But that didn't happen. My conclusion, "chicks love magic!" That was the line I said to my buddy who cracked up. They were probably there for the young stars like Franco and Eisenberg, but still, they were there and the movie was so well done that it was clear everyone enjoyed it. As a magician I would encourage you to see this movie because there are moments in the movie that are frankly inspiring. The water torture cell by Isla Fisher is superb. The way the magic show is shot in the round with big video screens around the theatre is honestly, something we should all look into. Five out of five stars for me! Chicks absolutely love magic! Not sure they love magicians, but they do love magic. Does Houdini get a name check in the film? John, I'm going to see the movie again but from first showing I don't recall Houdini's name mentioned. They mention Max Malini and there is a reference to David Copperfield, but if there was a Houdini mention, I missed it. No mention of Houdini. I saw it a second time and was watching out for the reference. There is an interview online with star of the movie Isla Fisher saying she studied Houdini for the role. There are also 5-10 interviews where she said she used magician escape artist Dorothy Dietrich as the role model for her part. She pays many compliments to Dorothy and suggests people look her up on Youtube.